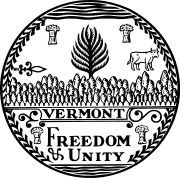 The 1900 United States presidential election in Vermont took place on November 6, 1900. Voters chose four representatives, or electors to the Electoral College, who voted for president and vice president. Vermont overwhelmingly voted for the Republican nominee, President William McKinley, over the Democratic nominee, former U.S. Representative and 1896 Democratic presidential nominee William Jennings Bryan. McKinley won Vermont by a landslide margin of 52.87 percentage points in this rematch of the 1896 presidential election. The return of economic prosperity and recent victory in the Spanish–American War helped McKinley to score a decisive victory. ^ "1900 Presidential Election Statistics". Dave Leip’s Atlas of U.S. Presidential Elections. Retrieved 2018-03-05. ^ "1900 Presidential General Election Results - Vermont". U.S. Election Atlas. Retrieved 23 December 2013.